1895: The Automobile Club de France was founded. During the first 8 years of its existence the club organised 34 intercity races, including the first international race, the Paris-Bordeaux-Paris in 1898 won by Frenchman Fernand Charron in a Panhard et Levassor. 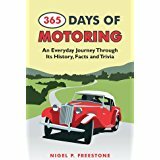 1910: The American Grand Prize, a Grand Prix auto race, was held on closed public roads outside Savannah, Georgia. The race began at 09:00, with cars leaving the start line at 30-second intervals. Victor Hémery, driving a Benz, led early. Arthur Chevrolet was second after lap 1, but would eventually be overtaken by the factory Benzes and Fiats before falling out of the race on lap 9. Felice Nazzaro took over second place and pushed hard to catch Hémery. After setting the lap record on lap 7, Nazzaro slid off the road into a ditch, bending his rear axle; he would retire a few laps later. Wagner assumed the lead, but he too would leave the road and strike a tree on lap 17. He resumed, but front axle damage later sent him into a cartwheel at speed, ending his race. Ralph De Palma, Bruce-Brown, and Hémery took over the first three positions, within two minutes of each other. On the penultimate lap, De Palma cracked a cylinder in the last of the Fiats. 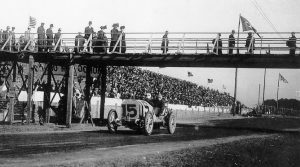 At the finish, Hémery crossed the line first due to the staggered start, and as in 1908 was forced to wait for the next car to cross the line. In the end, Bruce-Brown finished just 1.42 seconds faster than Hémery. 1928: Racers Earl de Vore and Norman Batten, winning co-driver of the 1925 Indianapolis 500, were lost at sea en route to South Africa aboard SS Vestris. 1950: Juan Manuel Fangio in a Ferrari 166 won the Paraná Grand Prix held at Urquiza. 1966: Racer Don Branson (46) was killed when he crashed during a midget race at the Ascot Motor Speedway in Gardena, California. once before in the history of the Formula One World Championship, at the 1969 Spanish Grand Prix when Jackie Stewart took his Matra to a two-lap victory over Bruce McLaren at Montjuich Park in Barcelona. 2001: Rubens Barrichello, Tony Kanaan and Mario Haberfeld teamed up to win the Granja Viana kart race in Sao Paulo. The race, which lasted for over six hours, attracted over 100 entries including F1 drivers Enrique Bernoldi and Ricardo Zonta. 2007: Honda Racing announced that Ross Brawn would join the team in the role of Team Principal with full responsibility for designing, manufacturing, engineering and racing Honda’s Formula One cars. On the same day, Ferrari announced that from January 1, 2008 Stefano Domenicali would take on the role of director of Ferrari’s Gestione Sportiva, a position held – on an interim basis – by Jean Todt. 1966: British driver John Surtees won the final race of the inaugural Can-Am season, in the Las Vegas Valley in Nevada, driving a Chevrolet-powered Lola T70, to become the series’ first champion. 1988: Alain Prost recorded his 35th career win at the Australian Grand Prix despite suffering major handling problems after hitting debris while McLaren team-mate Ayrton Senna took second despite a malfunctioning gearbox. It was a sign of how dominant the McLarens had been that even with these handicaps the pair still finished well ahead of the field. Gerhard Berger realised his Ferrari had no chance of winning and told his fellow drivers he was out to enjoy himself. “I’m going to come past you,” he grinned at Prost, “but you don’t have to worry about it.” Berger set off at a crazy pace which ensured he would run out of fuel long before the end but in the event his race ended when he piled into a slow-going Rene Arnoux. Championship with 108 points, while Benetton were 5 points behind with 103. Schumacher took the lead at the start, with Hill second behind him. The order remained the same until lap 36. Hill was catching Schumacher when the Benetton driver went off the track at the East Terrace corner, hitting a wall with his right side wheels before pulling back onto the track. Hill had rounded the fifth corner of the track when Schumacher pulled across the track ahead of him to the left. At the next corner Hill attempted to pass Schumacher; the two collided when Schumacher turned in. 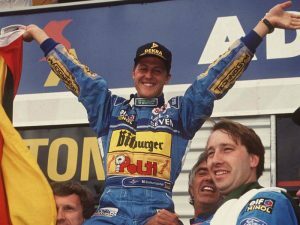 Schumacher was eliminated on the spot. Hill attempted to continue the race and pitted immediately, but retired from the race with irreparable damage to the car’s front left suspension wishbone. 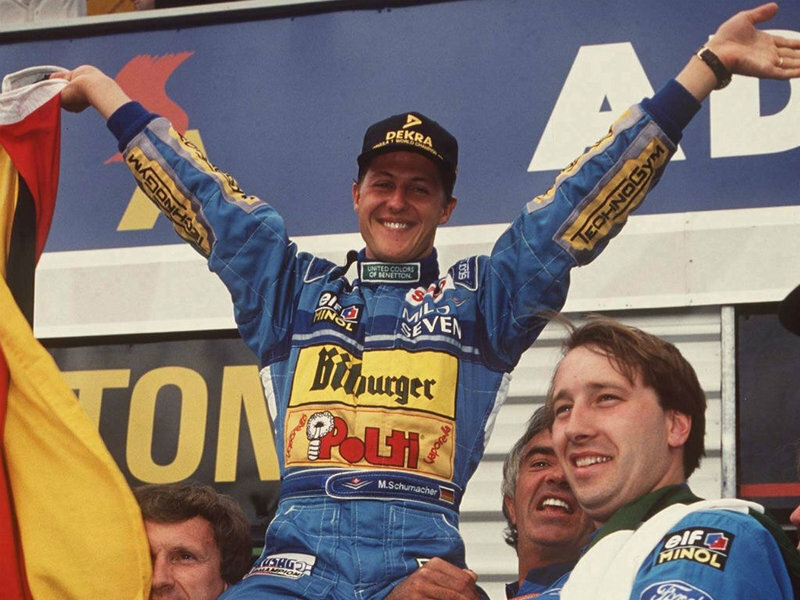 As neither driver scored, Schumacher took the title. The race also marked he last appearance in a Formula One Grand Prix of the first incarnation of Team Lotus, previously seven-time Constructors’ Champions. 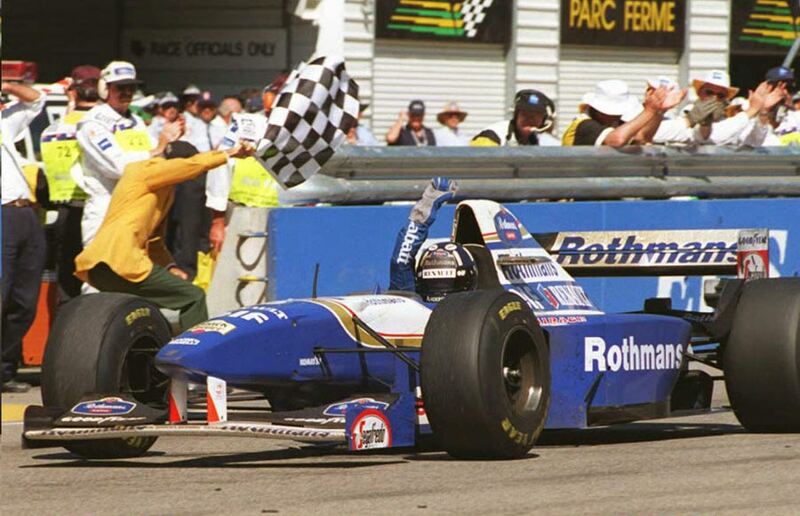 It was also the 31st and last Grand Prix victory of Nigel Mansell’s Formula One career. 1995: Mika Hakkinen left the intensive care unit after his life threatening crash during practice for the Australian Grand Prix just over a week earlier. Hakkinen suffered a punctured tire in the high-speed Brewery Bend and his McLaren arrived in the corner sideways in fifth gear. As the car spun, it hit the kerbing backwards and was launched into the air. It then hit the ground just before smashing against the wall. It later emerged that Hakkinen suffered a fracture around the base of his skull and some internal bleeding as a result. Doctors were initially worried that Hakkinen’s brain might swell inside the skull and cause brain hemorrhaging. That is what killed American F1 racer Mark Donohue two days after he crashed in Austria in August 1975. In fact, it was not a problem, and in the course of Saturday Hakkinen regained consciousness. 2005: Nigel Mansell was on the top step of the podium again after winning the Altech Grand Prix Masters in Kyalami, South Africa from Emerson Fittipaldi in front of a crowd of 70,000. “I started on pole and that was the critical factor today given how hard I was pushed by Emerson,” said Mansell. “He just didn’t give up and nor did I expect him to. I tried to break-away from him but he just kept his nose behind my car and on a couple of occasions made moves on the inside of corners.” Mansell’s former Williams team-mate Riccardo Patrese finished third. All participants in the Grand Prix Masters series which featured retired Formula One drivers raced identical open wheel cars, which are based on the 2000 Reynard 2KI Champ Car. The chassis was built by English constructor Delta Motorsport, and was powered by a naturally aspirated, 3.5-litre, 80-degree V8 engine produced by Nicholson McLaren. The engine was based on the Cosworth XB engines previously used in IndyCar racing, and according to the series’ organisers, it produced more than 650bhp at 10,400 rpm with over 320 lb·ft (434 N·m) torque at 7,800 rpm. The series folded after a 2 race season in 2006.